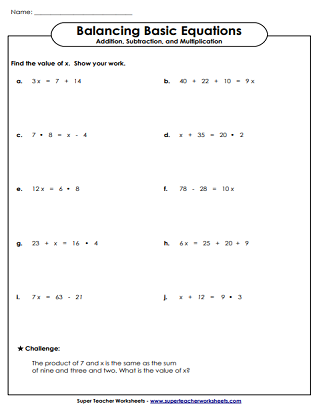 Print basic algebra worksheets in which students balance basic equations and find the values of variables. Make these scales balance. Illustrations show two numbers on one side and a number and a variable on the other side. Balance these basic equations and solve for the variable x. These equations have only addition and subtraction. Balance these basic equations and solve for the variable x, indicated by a blank line. 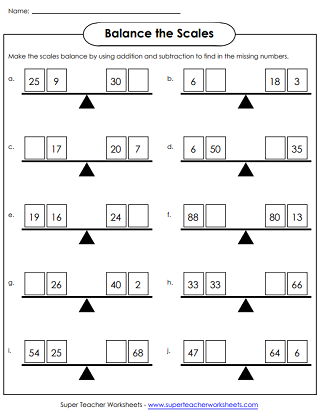 The problems on this worksheet requires only addition and subtraction skills to solve. Balance these equations and solve for x. These equations have addition, subtraction, and multiplication. 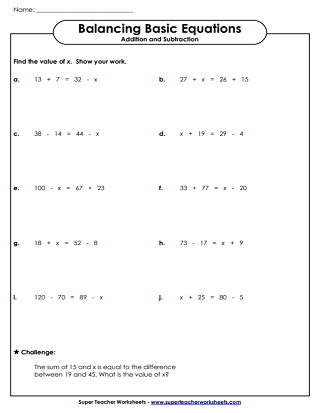 Read, write, and solve basic algebraic expressions and equations.